Baltimore Police fired gas to enforce a curfew on the streets, a night after violence and arson rocked the city. After an evening of largely peaceful protests, a few hundred people defied the deadline of 22:00. In the face of thousands of troops on the city streets, the remaining crowds later dispersed and police said the curfew was working. The protests have gone on daily since the death of African American Freddie Gray in police custody on April 19. 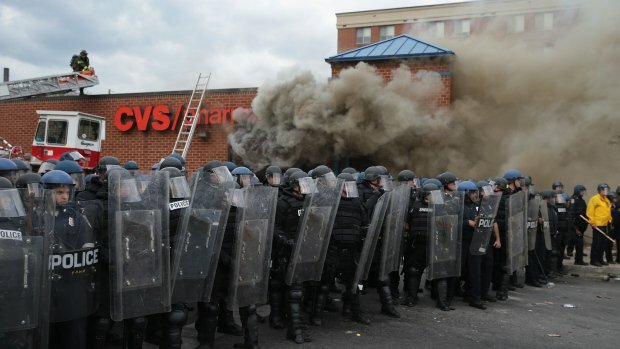 There was an outbreak of violence after Freddie Gray’s funeral on April 27, but a different atmosphere characterized the streets the following night. Two hours after the start of the curfew, which runs from 22:00 to 05:00, Baltimore Police Commissioner Anthony Batts said it was working well. There were “no major issues” and only 10 arrests, he said. A few individuals threw bottles and gas canisters at police but there were no major clashes. The National Guard had been sent to Baltimore to stop unrest for the first time since 1968, when some of the city’s neighborhoods went up in flames after the assassination of the Reverend Martin Luther King Jr.
Baltimore leaders and pastors had urged calm on April 28, after about 200 people were arrested the previous night as more than 100 cars were set alight and 15 buildings destroyed. A mother who was filmed smacking her rioting son, instantly becoming an overnight celebrity, has spoken out about her widely praised actions. “He knew he was in trouble,” Toya Graham told CBS News. At a news conference on April 28, President Barack Obama harshly criticized the perpetrators of “senseless violence and destruction”. Barack Obama described the issues behind the protests – the use of force by police against African American men – as a “slow-rolling crisis”. The person hoping to follow him in the White House, fellow Democrat Hillary Clinton, also spoke out, calling it “heartbreaking”. “We have to restore order and security,” Hillary Clinton told a fundraising event in New York. Freddie Gray, 25, died after suffering unexplained injuries to his spinal cord in police custody and spending a week in a coma.